Adds strength and stability to your table. Adds strength and stability to your table. These low profile supports will let you load up the table without fear. Use two supports per leaf, for smaller leaves, one support per leaf is acceptable. Travels out beyond table edge 7-3/4"
Product was shipped and arrived quickly. Great quality! The drop leaf supports I ordered arrived quickly. These drop leaf supports were perfect for my application. A little lone for my needs but easily adapted. So simple. Well manufactured. Would like some recommendations regarding positioning. It works very well for a small sewing machine table leaf. Great for table extensions, easy to install, good support. 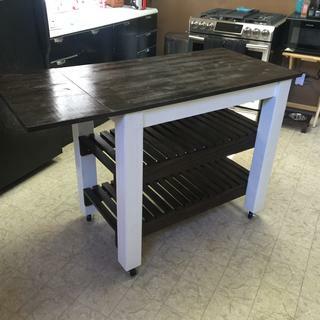 I made a 30x72in table with two 12in extensions with made of 2x12s these worked great with the table. First time user of Rockler, will now look here first for future items. Product was perfect, exactly what I was looking for and is made of good quality. Delivery was trackable and on time. These drop leaf supports are easy to install, easy to use and are well worth the short money I spent on them. I would buy these again and would recommend them to anyone looking for an inexpensive solution for a drop leaf table support. Love them. Super fast delivery. Easiest part of the entire little project. Very, very pleased with the product! It works great on an old table. Very, very pleased with how fast delivery was. I have a teak dining table off a shi with rather heavy leaves. I bought 2 for each leaf and they worked great. No sagging. Was easy to install and wiorks great . A good solution for cortecting sagging leaves. These add tremendous support. I added two to the middle section of each side and it doubled the strength of the table. They work great. Sturdy, easy to install and they have a slight upward projection that counteracts the natural sag. Ordered this item, it was not compatible with the table, ordered the spring type and worked perfect. I have two other dropleaf tables so I will see if the a metal dropleaf support can fit one of them but I got the spring one and it is great thank you . Fixed our sagging custom made table leaf. Very happy with it! 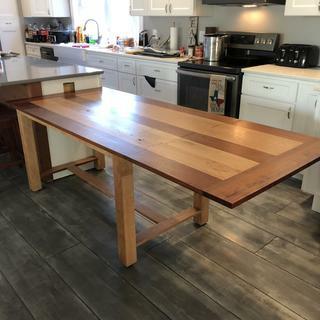 I built a portable kitchen island with a hinged drop leaf, this worked perfect for keeping the drop level and is easy for my wife to slide out of the way to lower leaf. the support seems strong enough to hold weight on the leaf and thin enough not to take away storage room underneath had I built one myself. If I ever do another project similar to this for the price I will use these supports. Worked Great. Easy to install and operate and is strong. This hardware was easy to install and works great. I found that you need to be aware of two things. First for a drop-leaf table you need to stagger the supports so they don't conflict with one another. The other issue is to be sure to make the notch they fit through the side of the table wide enough. I would recommend this product to others. 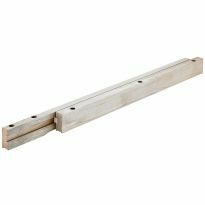 Rocker supports for drop leaf table best quality for the price! You can't go wrong checking the various supports offered ! I ordered these brackets for a 50's drop leaf metal table! These brackets are easily installed . They were exactly what I needed! As I read about the various sizes offered the description helped me make the right choice! I ordered 2 pair. The price was good and these supports hold the leaves up in a straight line! Thank you! The supports on the leaf of our butcher block work table failed, and these were just the ticket to replace them. Used this on my moveable island with an 18" extension. They work great and slide in and out with ease. Works as designed. Does the job easily. Easy to install, well designed and sturdy. What a difference! We put two on each side and it is as strong as a bull!!! Love these braces and will not hesitate to spread the word where we got them and how helpful the people at Rockler were and are!!! It worked perfectly for a drop leaf on a table I built for my wife's sewing room. Just what I needed, although we did cut them down but worked great. Everything that I have bought from Rockler has been above average and the leaf supports worked wonderfully. Easy install with minimal tools. The drop leaf repair worked great! Table strong and sturdy again. I'm a contractor and used these for supports to make a 5-0 dropleaf edge on a kitchen island with a 2" butcher block top. I received my order in just a few days. Packed very well. Product is of good quality and was easy to install. I would order from this company again and reccomend them. Was very impressed with the catalog. Looked at home centers and could not find this hardware. Found it here. Thank you. I do not have a picture yet...Thank you. Great price. Very well made and substantial. This device should last as long as the table on which it was installed. The shelf support installation was easy enough for a beginner and sturdy enough for advanced woodworkers. Simple and easy to install, strong enough to support enough weight without sagging. Just what I needed at a good price. 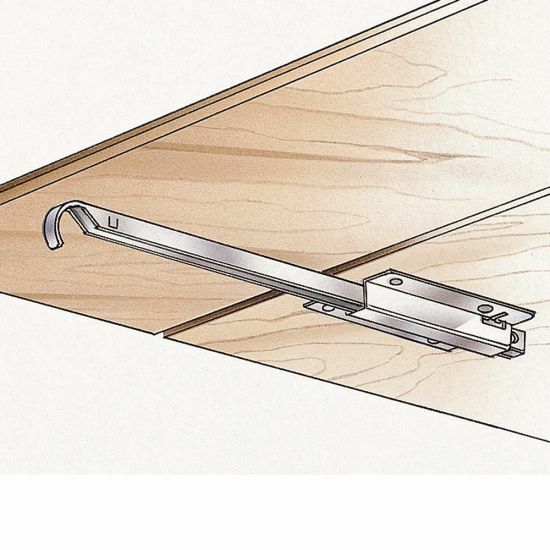 Drop leaf brackets have a built in slant so it hugs the leaf tightly as it slides into place. Very easy to install in just minutes. Excellent metal drop leaf supports. Just screw in place and it holds leaf tightly. Holding 2 x 12 x 30 inch leaf. Great quality with included screws! Item was as described, delivered quickly and fit perfectly to enable us to fully enjoy the table ! Thank you ! Used on my kitchen table that has two folding leaf's on each end. 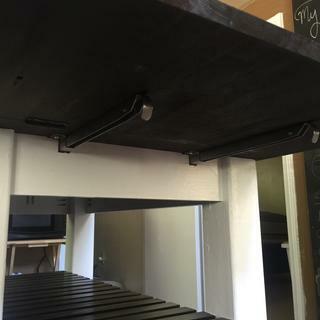 I was unable to find the original wood slats so I decided to fold up ends permanent with these brackets. Fit like a glove. We broke the antique leaf support but this one is great quality and works great. Worked perfectly for the extension of a drop leaf section of countertop we added to our RV. It was better that we expected. 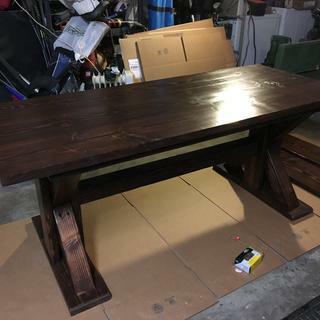 We're making a custom table for our father. This item is exactly what we were looking for! I am creating a dropleaf sewing cabinet for my Mother-in-law. To hold up a small fold down piece attached to a larger piece of wood. could not find any my loca hardware stores. It was exactly what I was looking for and could not find in regular hardware stores. My carpenter who built my kitchen island said he needed this for the drop leaf. 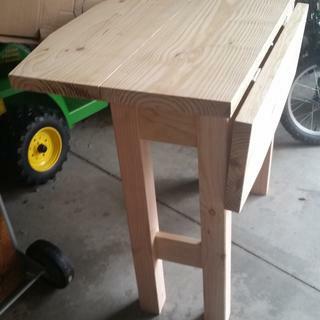 Im building a drop leaf table that does not have an apron. The slides support 50 pounds. This product appears to be what I need to make my table usable. seems to be exactly what I need to support a drop down shelf of a cabinet I inherited from my father. Had used angle type before, a new one , presser on it would fall down. This seemed like the best solution for my table. I t looks to be what we need. It looks sturdy. Thank you. I am adding a drop leaf to a cart. Could not find this type of item in my local stores. It is exactly what I need to support a small workbench drop leaf top I built in my transit van for work. To finish a table I mad for my boat. Trying to make a vintage dropleaf dining room table fit for use. The leaves, which drop down on hinges, sag when put up, because the original spring brace sags. Comments and questions by previous customers answered my questions too. Reviews noted high quality and thoughtful design. Just what I was looking for and the reviews were good. 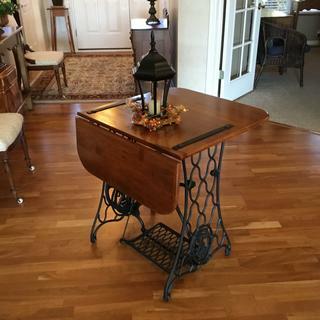 I chose this item for a drop leaf table that a carpenter is making for my kitchen. The leaf on each side of the table will be 12 inches in width and will fold when not in use. I selected this item based on availability, need and posted reviews. how long is the bracket? BEST ANSWER: The plate that mounts to the table is 5" x 1-7/8". What is the length of the support when the extended part is fully retracted? In other words, what's the MINIMUM length of the support? What are the height and width of the arm? BEST ANSWER: height is 5/8" width is 1/2" and the length is 14-5/8"
Making solid oak kitchen drop leaf table. 24x44 (3/4") with 9 x 44" leaves ( each side). Do you recommend 1 or 2 supports if I use the metal support bracket (30006)? I see measurement of length. Wondering about the depth of the bracket? 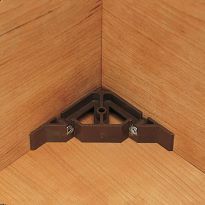 I plan to router out a channel to place the bracket and wondering how deep to make the depth. Will this #30006 product will support the weight of a butcher block leaf (26"W x 17"D)? Butcher block is 1.5" thick. Thank you. BEST ANSWER: HI, I am Jackie's better half, Jim. I would say you will need 2 of these or maybe 2 heavier duty if your butcher block is very heavy. 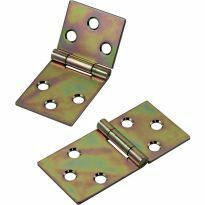 I used 2 of them on a 1" thick table I built for in our motor home and they work great. I think that if you have 2 of these supports underneath, that they would support your butcher block leaf easily (unless maybe you jump on top of the leaf after that). It should, but if there is ongoing additional weight applied to the block leaf (e.g., from someone working on the surface), the product may bend over time. YOU MIGHT NEED MORE THAN JUST 2 OF THEM. 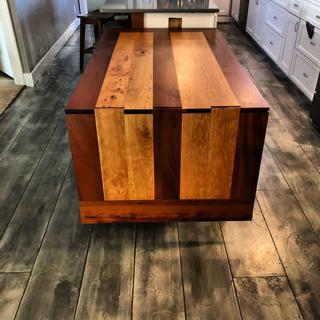 EASY TO INSTALL BUT BUTCHER BLOCK COULD BE HEAVY. THEY WORK FOR ME 3/4 IN PLYWOOD 2 1/2 FTX 2 FT. I think so. I have two supports holding up a 1.75 x 45 x 12 inch leaf and can hit on it. BEST ANSWER: Color is really just the users preference. Since the support as I installed it was beneath the table and not visible, I used the plain steel (or silvertone) finish. If any part of yours might be visible or any other components are brass, then; you may wish to use the brass finish. I would like to add that; the support was incredibly sturdy and I was very pleased. Thanks, Larry. I didn't notice that a choice was offered. I'm going to look into that as I would prefer the brass look. Brasslike. I used these for a drop-leaf table on my boat so it fits with the nautical feel. BEST ANSWER: Irina - I installed them in a fashion that seems similar to what you are doing. The leaf is stored in the closed until needed and the supports are pushed in just inside the table edge - you can see them, but only if you really look for them or are at an angle below the table. 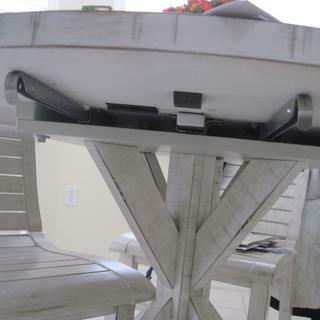 The support handle is NOT removable and stays under the table. I used the Click Latches on this website to get a tighter fit. The end has stops to prevent them from coming out. You would have to cut the end off to remove it all the way. Please could you tell me what the metal is? Many thanks. Will these support a board that is 12” wide 4’ in length? BEST ANSWER: Enter an answer to this question.Yes I think so. Depending on the type of wood because of the weight. I recommend using three minimum for a 4 ft board. It depends on how much weight you plan on placing on it. That said, I used 1 to support a leaf ~18" wide & 10" deep. D Mc. 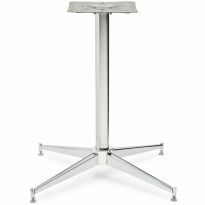 Yes, not rated for anything heavy duty on top but certainly good for table extension. The widest board I have used them on 7". I personally wouldn't go that wide. Yes. Mine are supporting a 12" X 2' drop leaf. Very sturdy. How sturdy are these, I am thinking about ordering 2 pair for a work bench that is 8 feet by 32 with a 16 inch by 8 feet leaf. It is put on with a piano hinge. So I was thinking of use 4 of these, do you think it would work? BEST ANSWER: We used ours for the table in our vintage camper. The owner before us cut the table 1n 1/2 odd thing to do so the piece being supported is about 18" in the support direction but only 24" wide. I used two supports. They work fine I would have liked longer ones but if your going 8 ft. you might need a few more. Don't forget when not being used you need to place the storage piece back enough to store the support so it won't bind the dropped part. Honestly, that implies a lot of weight could be applied to the drop leaf. I do not think that I would trust that size piece of wood with any amount of stress to four of these, even though they are pretty sturdy. I would opt for making 2-3 wooden slides instead, which would be able to extend out further and be more substantial. YMMV on that, it's just my opinion. These are very sturdy supports. 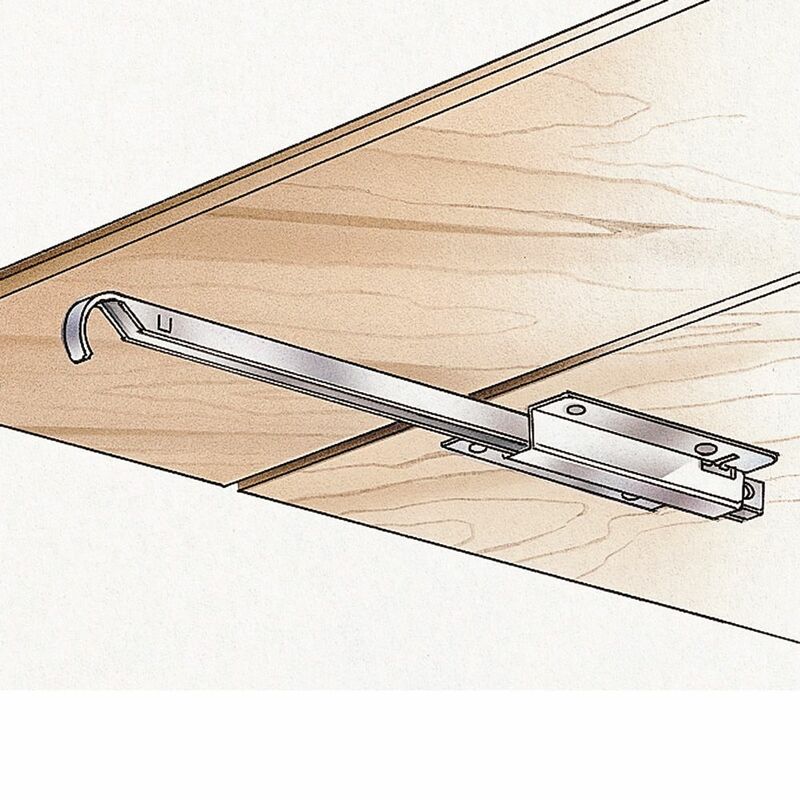 The weakest link would be the fasteners used, thickness of the wood and type of wood. They are not the most elegant supports but you don’t really see them unless you’re looking for them. I would say yes, they should work fine. A work bench needs to be super heavy duty and I don't think these are long enough to support 18 inch under industrial use conditions.. I Think 4 per side (they are sold in pairs) should work. They are very strong.. 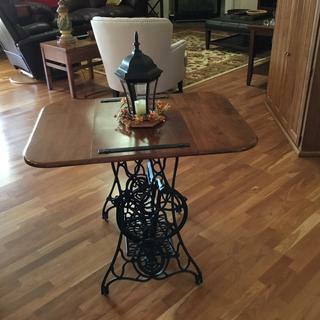 I have an antique Stickley drop leaf/swing leg dining table that is a family piece. While the table itself is lovely, I can't stand the swing leg as whoever is sitting on the end has to straddle it. Would this product work to replace the swing leg? BEST ANSWER: It depends on how big the extension is and how heavy. I wouldn't use it unless the support can be under 3/4 of the extension. I had to use 3 to support a 24" wide formica (heavy) extension I made but the supports go 3/4 of the way of the depth of the extension. Hope this helps. Also think about how it will look. I had to put ours close to the edge so the support ends do show a lttle. Yes it will work on your table. Have a wood pin table 2 inchs thick 30 wide by 59 long want to had 2 drop leafs at each end 30 x 30 . are the supports strong enough? and how many set do i need? These are good supports but I would not use on anything deeper than 12". If your leaf was 30x12, I would say 2 would do the job fine. A 30" deep leaf is too long and will create too much leverage in terms of distance from the hinge if somebody leans on it. You should be looking at building a sliding frame out of 1x3's or similar that can provide support all the way out the depth of the leaf. Can the support arm slide out of the bracket? I need to mount the support arms to the underside of a very small leaf that I can remove and slide back it in when I want to use it. The leaf is 4''x 27 '' and is part of a small folding camper table I have made. The table can't fold up with the leaf extension on it. I'm looking for a simple way to place and remove this leaf to make my table a little wider when in use but to use this support it must come apart. Please advise. BEST ANSWER: it does not come out. i had a narrow leaf i had to support and mounted the supports on a diagonal angle so they would not protrude past the leaf when pulled out and would allow the leaf to fold down when the support was pushed in. they work well. It does not slide out however can’t you just mounted a little further under the table so that it just appears and then it will extend the only when you need itEnter an answer to this question. The leaf will not be stable unless it it fastened to something. I was hoping I could avoid putting dowels in it and just fastening the extension arm by screws to the underside of the leaf and just pulling the leaf and afixed arm out all at once and then just sliding it back in when wanting it. I installed hinges on the back side, removed the hinges pines, and replaced with quick release pins. Are these supports used instead of the locking hinged ones? 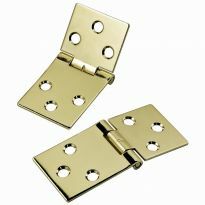 BEST ANSWER: Yes they can be used alone or in conjunction with the locking type.They are easy to install,heavy duty and conveneint. I bought two pair for two separate jobs and they have worked out perfectly. These hold up my leaf better because they are ridgid when extended and doesn't allow for the leaf to drop because of excess weight put on them. 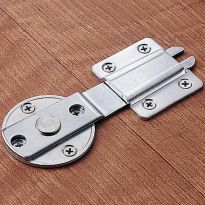 Yes - i used these and normal hinges to support the table leaf. No. The arm cannot be removed. It only slides in. No ... the arm will not slide out. I have a pedestal table that extends with the leaf in the middle. The ends of the table day and are unsteady. Will these work to provide support? I want to use the table extended at all times. BEST ANSWER: I used these to hold up the drop leaf of a table made from 2x6 boards. It's pretty heavy, so these should have no problem with a regular thickness top. I'd use two per side if you're concerned - that's what I did. It's overkill, but piece of mind is worth it sometimes. Yes. We used 2 for a 4 foot leaf and they hold it quite steady. Does this just slide back in, or is there a locking mechanism to unlock before it slides in? I'm going to install in side of desk and won't have easy access to end of it. BEST ANSWER: The slide just slides in and out. There is no locking mechanism. You will need access to the handles of the slides to slide them in if your leaf is permanently attached with a hinge. When out the slides are held in place by the weight of the drop leaf. Slides in and out . NO LOCK!!!!! Is this suitable for outside use? Is it stainless? Hello! What is the distance lengthwise between the 2 screw holes? I am repairing a vintage table and would like to use existing holes if possible. Thank you! BEST ANSWER: the center to center distance between the hole on this product are 3-3/4" and 1-1/4"
I do not know the distance, it was on an island that i do not have any longer. What is the load limit when using (2) of these supports? BEST ANSWER: The load limit depends significantly on the material the support mount's screws are fastened into. Two supports fastened into solid hard wood or good quality solid-core ply wood can hold the weight of an adult putting both arms and their upper body weight on a table leaf. If fasted into particle board or soft pine much less as the screws will eventually strip out. I sorry I don't know the load limit, but they seem very strong. I have not had any problem setting 15 or 20 pounds on the extension. Can anyone tell me how the stop at the end of the arm is made? We need these shorter, and would like to cut it down and replace the stop. BEST ANSWER: I encountered the same situation. Simply cut the slide to the desired length and, using two pair of pliers, flare the end of the slide. The original stop appears to have been punched. This would be very difficult to do because the moving part does not come out, it has stops at the end. You would probably ruin the bracket if you tried to shorten it. My drop leaf is only 7" wide by 26" long, 3/4 oak. Is this an over kill or would one of these brackets work? BEST ANSWER: The bracket can be placed further back to fit your application, so it shouldn't be too long. It's sturdy, but will bend with enough force. I don't how much weight your leaf will need to support, but I recommend the product. I would like to replace the gate leg on my table would these work? BEST ANSWER: THat depends on how long (wide) the leaf is. If it is less then about 4 inches longer then the supports I would think it would work. If it is longer I would guess maybe not. 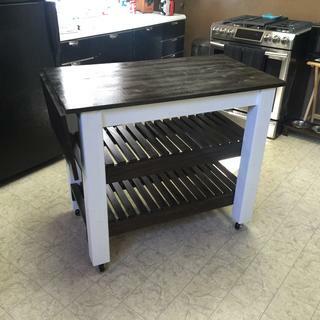 I built an ironing table from a wooden sideboard that measured 47" long and 16-1/2" wide. I mounted a 1/2" piece of plywood on the top of the sideboard so that it extended 7" on each side, and had a 2" overhang on the front side and a 5" overhang on the rear. I then screwed the plywood to the table burying the screw heads. The plywood was then covered with padding and a heat resistant aluminum fabric which was stretched and stapled to the underside of the plywood. While the ironing table is a good size as is, I would like to add a 12" wide extension to the back of the new "ironing table" that is hinged so it hangs vertically when not needed. I covered a 12" x 60" piece of 1/2" plywood with padding and heat resistant aluminum fabric and stapled it in place. My thought was to attach the extension to the ironing table using a 1-1/2" x 60" piano hinge. To keep the extension level with the table when used, these Rockler drop leaf table supports looked perfect. I can install 2 supports, mounted 6" in from each end of the 60" length of covered plywood. That would leave 48" of unsupported extension. Would 2 supports be enough for this length of table? If I needed additional supports, how many additional supports would I need in the middle? There is only 5" of plywood in the center of the table available to mount the supports. Is that enough space to mount this type of support? 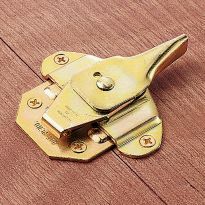 BEST ANSWER: I used a pair of these on each end of a 5/4" thick pine table that is 36" wide to support a 12" extension. The pair easily supports the removable extensions that weigh about 20 lbs. I only have 24" of unsupported area in between and the extension leaves are very stiff being 5/4" thick, so I am not sure how you would be affected with 48" unsupported area. Weight-wise, I think you should be fine, but from a rigidity perspective, a center table support might be better. They keep the leaf very flat with the main table but do have a little bit of flex if you push down on them. I hope this helps. How narrow can leaf be? Mine would be 8". BEST ANSWER: You will be fine with the narrow leaf of 8 inch with these. You will simply end up fastening the arm further back to account for the shorter leaf but it won't effect the functionality at all other than reaching back a few more inches to grasp and extend outward! BEST ANSWER: The price is per pair. When say a "pair" , is that referring to the sleeve and pole as a pair or actually a pair of brackets (2) ? BEST ANSWER: A pair of brackets. I only had to use one and saved the other for a spare. any chance you make this product in a smaller size? 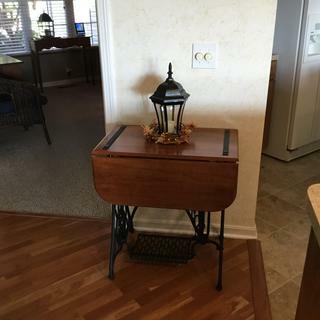 looking for maybe 12 - 13 inches for a drop leaf table. problem is customer wants middle section to be 14 inches. How many supports would I need for a leaf that is 6"x 42" long ? BEST ANSWER: These supports are built strong - two would handle a narrow little 6" shelf quite well. 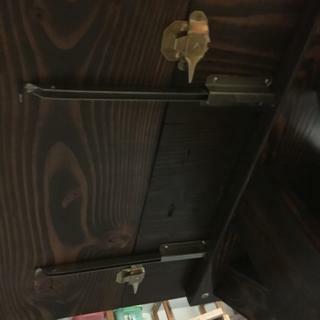 You would need to use enough hinges to keep the 42" parts lined up nicely in order for the supports to slide in and out without binding on a section of the drop-leaf that was slightly curved up or down.